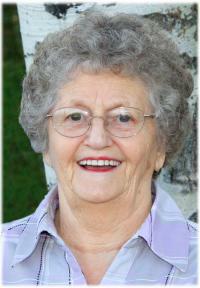 On Saturday, September 17, 2011 Jean Mottershead passed away at the age of 81. She was born on September 11, 1930. Jean is survived by her husband, Arnie; one daughter, Barbara (Tim); four sons, Brian, Glen (Brenda), Bruce and Garth (Lianne); grandchildren and great grandchildren; brother, Andrew Campbell; brothers and sisters-in-law, Stanley and Izola Mottershead, Lloyd and Chris Mottershead, Jim Ryan; sisters-in-law, Marlene Mottershead, Lucille Mottershead; and many nieces, nephews and friends. She was predeceased by her mother and father, Grace and Andrew Campbell; sister, Elsie Ryan; brother, Bill Campbell; brothers-in-law, George and Vic Mottershead. Jean was born in Beverly (Edmonton) and lived an active and vibrant life, often referred to as the ‘Tom Boy’ of the neighbourhood. She was active in Brownies and CGIT Girls Clubs, and proudly exhibited her baking talents by winning many ribbons and awards. She also enjoyed bowling and other outdoor sports. Her passion was for going to the casino and she was a constant winner at the slot machines. Jean will be greatly missed by all whose lives she touched in many ways. Her Funeral Service will be held at Foster and McGarvey Funeral Home, 10011 – 114 Street, Edmonton, AB on Thursday September 22nd, 2011 at 11:00 AM, with interment to follow at Westlawn Memorial Gardens. Memorial donations in memory of Jean may be made to a charity of your choice.